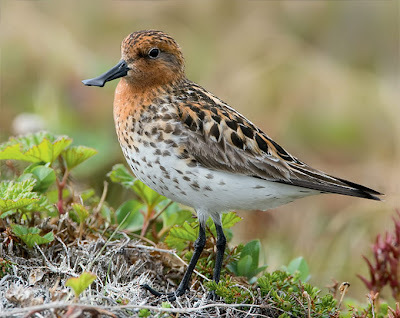 BC Rare Bird Alert: Help Support the Spoon-billed Sandpiper! Help Support the Spoon-billed Sandpiper! THE COOLEST SHOREBIRD IN THE WORLD? Well here's an opportunity to make a difference! The Spoon-billed Sandpiper project Birds Korea is doing with Cornell University's Lab of Ornithology is the making of a science-driven mini-documentary on the Spoon-billed Sandpiper aimed at a national audience. Filming is set to begin this year and is to be concluded in May 2014. The documentary will focus on the birds and key sites in the Republic of Korea, such as the Geum Estuary, Saemangeum reclamation area, Gomso Bay and the Nakdong Estuary in Busan, as well as leading figures in society. This project is happening at the same time as the Spoon-billed Sandpiper Task Force works on its captive breeding project in Eastern Russia and other smaller projects at South Korean schools aim to raise public awareness of the plight of this enigmatic shorebird and about what actions are needed to save this species from extinction. So in summary: Enhanced Public Awareness->Habitat Conservation-->More Spoonies-->Possibly leading to one popping up on our fair shores one day! On May 7th, Geoff Styles and Russell Cannings will be conducting a high-paced 24-hour birdathon near their homes in the Okanagan/Shuswap. They will be collecting pledges with all proceeds going to this important Spoon-billed Sandpiper project. You can pledge a flat rate, or make it interesting and pledge "per species." Although it's still early in the spring we plan to get over 100 species! OR, you can challenge us and try your own birdathon in the coast and/or interior!